2018, 120 minute performance, embroidery floss, graphite powder, white menswear shirt, linen, backstrap loom. Based on the double meaning of the French word for “story” and “history,” performance involves unthreading embroidered slang text for “North African” and “Jew” into abstracted textile. 2018, 120 minute performance, embroidery floss, graphite powder, white menswear shirt, linen, backstrap loom. Based on the double meaning of the French word for “story” and “history,” performance involves unthreading embroidered text into abstracted textile. 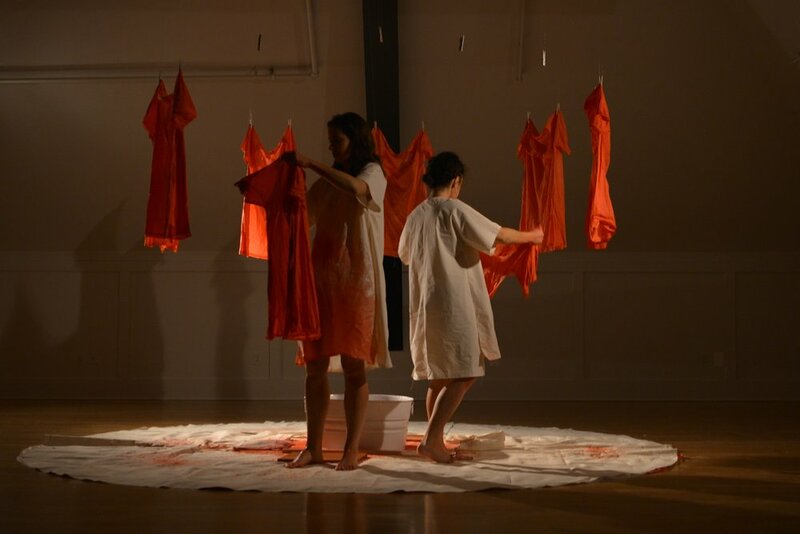 2018, Textile, metal container, canvas dropcloth, clothespins, red dye, 90 minute performance of washing garments in red dye and progressively hanging them up to dry. In collaboration with Georgia Saxelby. 2 garments also left with work. 2017, Cotton embroidery on felt, Microphone, wood. Approx. 7ft x 3ft x 3ft. 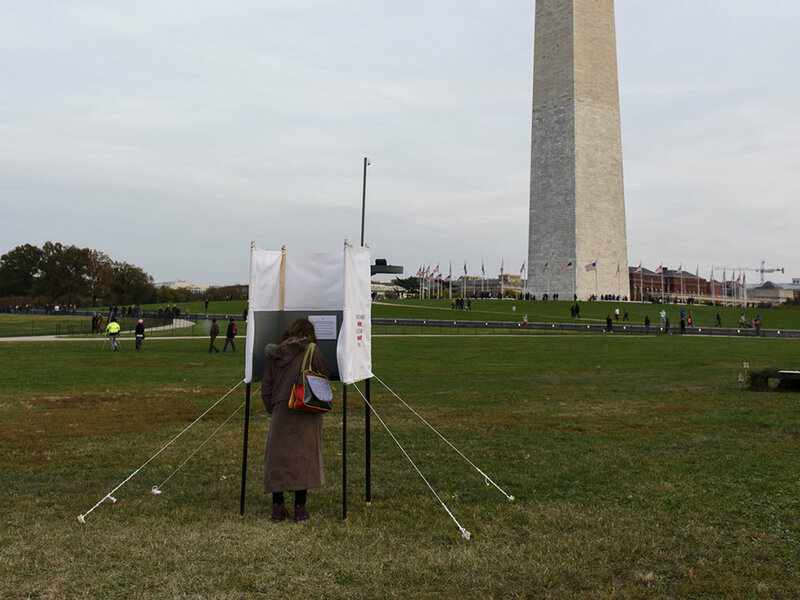 Installation occurred over a period of 12 hours on the National Mall. #TBT is textile installation that transforms memory into a simultaneously intimate and social activity. Made of several textile tents printed with testimonials collected on the National Mall in Washington, DC, the installation invites participants to write reflections on where they’re from, where they’re standing, and what they hope. Installed at the San Francisco Design Week. Video captured by Joshua Curry. Interactive installation, 2018, digitally printed textile, safety pins, paper, pens, Tents approx. 7ft by 7ft by 5ft. Installed at the San Francisco Design Week. Continued Histories is a textile with a visual memory (digital impression) that is reshaped into a social tool for conversation. The textile contains two images of acts of violence. Participants were invited to sew the two textiles together at Hillyer Art Space in front of portraits of Holocaust survivors. 2018, Interactive installation, digitally-printed organza and cotton, about 6ft by 9 ft.